In a humorously contradictory bit of logic, a State Farm insurance agent is urging voters to oppose an auto body shop owner in the Mississippi primary for “advocating an agenda that helps his businesses,” according to Republican John Mosley. 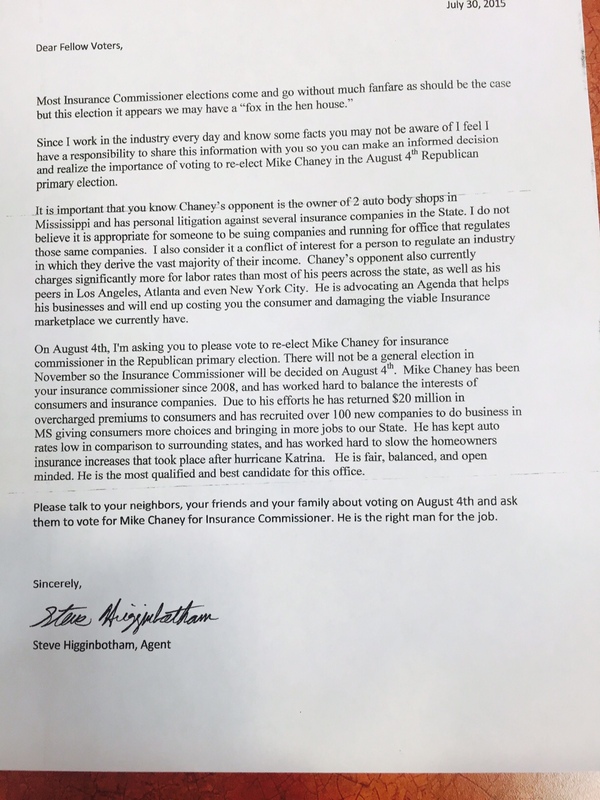 Calling it a “fox in the hen house” that a candidate who has lawsuits against the insurance industry and a business which derives income from the industry would try to regulate it, a letter apparently signed by State Farm-affiliated Steve Higginbotham urges voters to support incumbent Republican Commissioner Mike Chaney. Mosley says another Jackson, Miss., State Farm-affiliated insurance agent has also released a similar letter. “They are grasping at straws trying to defeat me,” Mosley said Friday. We could not reach Higginbotham late Friday afternnon for comment and to confirm he wrote the letter, which was provided to Repairer Driven News by the Mosley campaign. 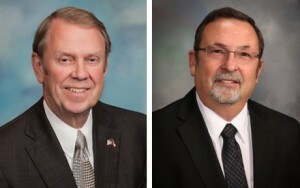 However, the insurer’s Facebook posts indicate he supports Chaney. We also late Friday afternoon contacted the other insurance agent cited by Mosley for similar comment and confirmation, but have not yet received a response. “Since I work in the industry every day and know some facts you may not be aware of I feel I have a responsibility to share this information with you,” the letter states. While both writers have ties to State Farm, the company said Friday the letters were not part of a corporate initiative. State Farm was not among the major insurers which donated to Chaney. The letter also states Chaney has “worked hard to balance the interests of consumers and insurance companies,” returning $20 million in overcharged premiums to consumers and recruiting 100 new insurers to Mississippi. It also credits Chaney for lower auto insurance premiums and trying to keep homeowner insurance premiums lower post-Katrina. Homeowner’s rates in Mississippi are still four times higher than before the hurricane, WAPT recently reported. “I’m (going to) correct that for them,” Mosley said. Of course, in Chaney’s defense, all of the states in the Gulf Coast are in the top 10 for both homeowners and renters’ insurance costs, according to the Insurance Information Institute, citing 2012 National Association of Insurance Commissioners data. The letter also accuses Mosley of charging more than repairers in New York, Atlanta and Los Angeles. In the Capitol Body Shop et al v. State Farm et al lawsuit, attorneys for Mosley and other collision repairers wrote in March that he and another Mississippi plaintiff shop charged $75 an hour for body work in 2014. Mosley said Monday he now charges $65 an hour. The lawsuit also accused insurers of refusing to pay more than an artificially set prevailing rate of $46 an hour, a claim echoed by lawsuits in other states alleging an improperly deflated insurer rate. In this vein, National Auto Body Research is attempting to look at not only what rates are, but what repairers feel a fair price would be in its Variable Rate System study. Results from Texas and Florida, the two Gulf Coast states surveyed so far, indicate that Mosley’s $65 an hour for body work would fall somewhere between the average to above-average end of that “fair and reasonable” price spectrum, depending on the state. Looking at the other two Southern states with VRS data available, Mosley’s rates land between the above-average to highest rates considered fair by repairers in Georgia and in the average to above-average range for North Carolina body shops. Clarification: An earlier version of this article cited Mosley’s 2014 labor rates. We’ve updated it to reflect his new rates.